Bruce Lamb alongside one of the new signs. ROADSIDE signage promoting local community radio station Tyga FM has sprung up in several locations this week. 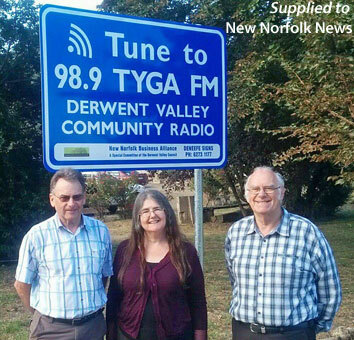 "As you are driving into New Norfolk you may notice our new Tyga FM Community Radio signs," station manager Ros Chapman said. Erected at four locations on various approaches to New Norfolk, the signs serve as both a reminder to local residents and a heads-up to visitors to the town that they can tune to 98.9FM to access the Derwent Valley's community radio station. "A big thank you to all the people who made this possible - the Community Broadcasting Fund and the New Norfolk Business Alliance who helped to fund the project," Mrs Chapman said. "Also to Deneefe Signs as well as local land-owners Jan and Terry Lane, Liz and Craig Fraser and our friends at Norske Skog."